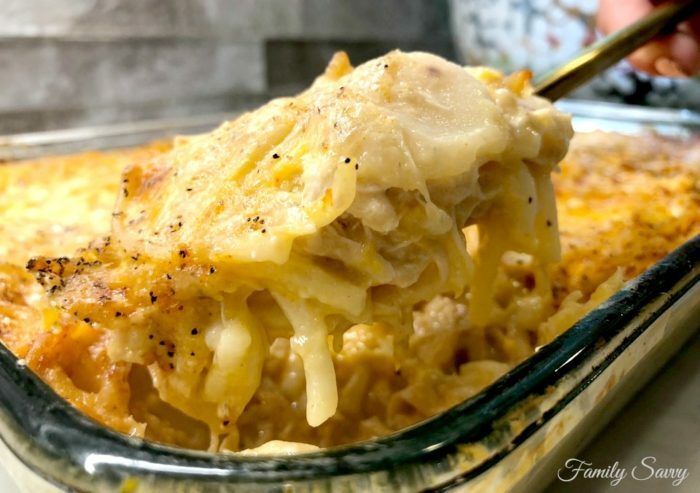 This favorite chicken tetrazzini is famous in my circles and a must-have recipe for any cook, it is easy, make-ahead, freezer friendly and ALWAYS a hit! 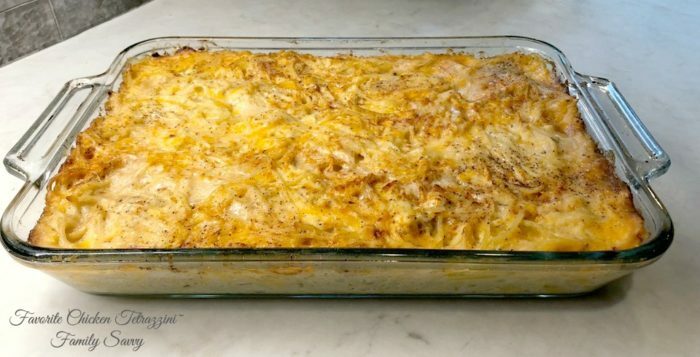 Favorite Chicken Tetrazzini is a must-have recipe for anyone who loves to entertain or make comfort food for family and friends. This is an easy version of tetrazzini that does use canned soup; however, it is made in such a way that the soup isn’t overpowering or obvious~it simply complements the other ingredients. If you want to cook this ahead and freeze for later, there are a few things that you’ll want to have on hand so that the tetrazzini will be properly wrapped and not get freezer burn. I almost always make tetrazzini several weeks before I plan to serve it, and it has never tasted one bit like it has been previously frozen. Cling Wrap I lay this wrap directly on top of the assembled (but not cooked) tetrazzini and tuck lightly into the corners of the pan. This is a good first layer to prevent ice from forming on the top. Disposable Containers- I use disposable aluminum pans, as they are easiest for freezing and taking meals to others. I use one huge casserole pan (pictured) or two lasagna size pans for this doubled recipe that I am sharing. Aluminum Foil- After pressing Cling Wrap onto the surface of the tetrazzini, I then seal the top of the casserole pan tightly with heavy duty aluminum foil. Ziploc Large and X-Large storage bags- After sealing the pan with foil, I slip it into a L or XL freezer ziploc, These bags are large enough to accommodate casserole size pans, and they offer an extra layer of protection from freezer burn. These bags are typically at the other end of the aisle from the regular storage bags, near the matches and lighter fluid. Adhesive Labels- I buy adhesive labels and write what the dish is and the date it was made/frozen. Place tetrazzini in the fridge a day or two before cooking. Best results come from cooking thawed or mostly thawed tetrazzini. Remove cling wrap from tetrazzini; replace aluminum foil lightly on top of casserole(s). Bake covered at 300 degrees until heated through, roughly a couple of hours. Remove foil and cook until tetrazzini is golden and bubbling at edges. Allow tetrazzini to rest for at least half an hour to firm up to the best consistency. If tetrazzini is partially frozen, allow 45 minutes more cooking time. Note: The recipe will make one very large casserole or two lasagna size casseroles. For a company worthy meal, serve this tetrazzini with Baby Blue Salad or Mississippi Green Beans and your favorite yeast rolls. Finally, you can round off the meal with a sure hit~skillet blackberry cobbler. In the video below, I am making this Favorite Chicken Tetrazzini ahead and preparing for the freezer. 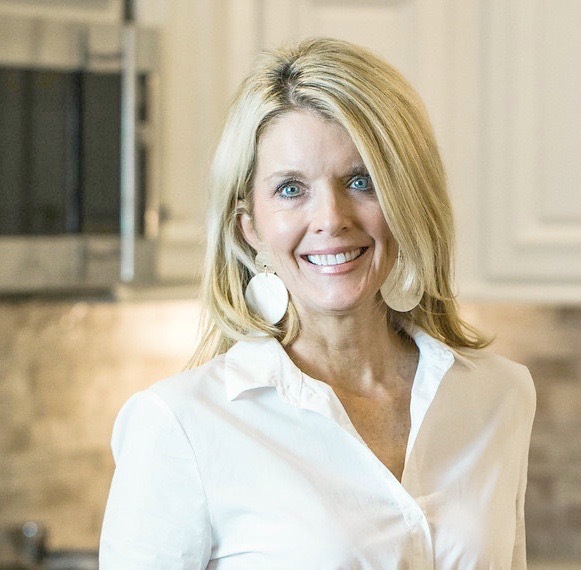 If you love chicken tetrazzini and don’t mind putting forth a bit more effort, you absolutely must try my friend Sally’s Gourmet Chicken Tetrazzini. Instead of using canned soups, you’ll make your own BÃ©chamel sauce. Trust me, you’ll think you’ve died and gone to heave after the first bite. Divine!!! 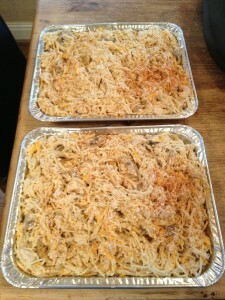 The ultimate comfort food, chicken tetrazzini freezes beautifully and can be a save-the-day meal when the need arises. I love to keep at least one in my freezer at all times. Cook chicken (I roast at 375 covered for 45 minutes). Chop and set aside. Slice and sautÃ© mushrooms in EVOO and butter until soft. Season with salt & pepper. Cook pasta 7 minutes or until al dente. 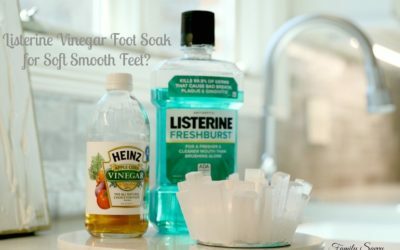 Drain, rinse with cold water, and set aside. Put soups and sour cream in large bowl; stir in can of chicken broth. Stir in mushrooms to the soup mixture, blending well. Add chicken, pasta, and cheddar cheeses. Stir until well combined and evenly blended. Spray aluminum pan(s) with Pam; spread tetrazzini in pan. Sprinkle parmesan and paprika on top of casserole. 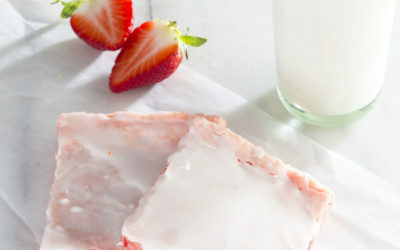 DO AHEAD: If freezing, stop here and freeze before cooking. If cooking, go to next step. Bake at 350 degrees for 45 minutes to an hour, or until edges begin to bubble. Hi Libby! I usually use two 11 x 13 OR for one huge amount I buy a large oversize pan at Dollar Tree. It is purely preference but I like to do 2 normal sizes. This recipe feeds between 10-12 (served with sides like salad, bread, etc…). Hope you enjoy! What are the exact measurements of pan you use? How many people do you feed? I want to make a 9×13 to freeze for a new mom. I read in the comments that that would be 1/2 of this recipe but I was wondering about only 6 oz of pasta. I want it to be really full and that seems to be a very small amount of pasta? Hi Nikki! You can use two 9 x13 (lasagna size) pans. I have also used an oversized pan. The pan size doesn’t have to be exact, it just determines bake time. Hope this helps! How many pans and what size pan is needed for this recipe. It’s a bit confusing to figure out. Thank you! Hi Kayla! If you want one lasagna dish, just cut this in half. I will say though, that while you are going to the trouble of making this, since it freezes well, you might consider making two and freezing one. Let me know how you like it! Iâ€™m still confused on how much this serves. I want to make one lasagna dish of it. Do I cut the recipe in half or leave it as is? Thanks. Hi Cheryl, I usually easily serve 10-12, but it depends on sides and whether you have lots of men (who eat more). Hope you enjoy it!!! Hi Colleen! The tetrazzini recipe shouled serve 13 for one meal….likely few if any leftovers. If using 2 11 x 13 (or similar) size pans, I just divide by two (it is about 3-4″ deep). If using a jumbo oversize pan, I put all of the tetrazzini in that one pan. Just remember to allow a day or two in the fridge to thaw; it cooks better than if from frozen. Please let me know how it turns out!!! I am having family stay for a long weekend and always try to do as much ahead as possible. I will have at least 13 adults for dinner (several nights). 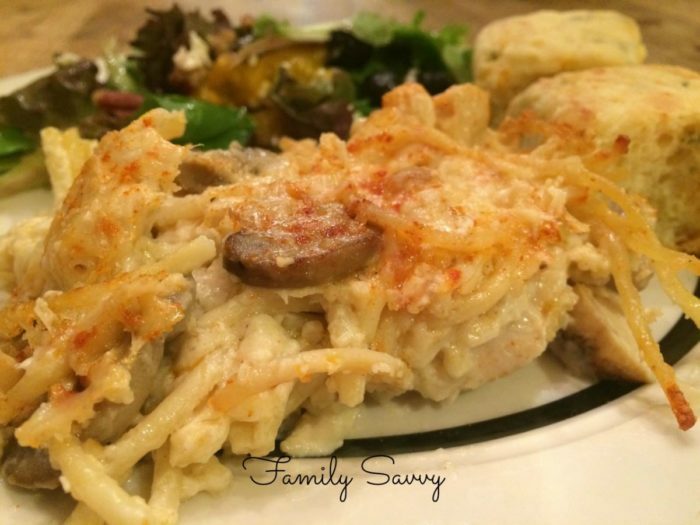 Your Chicken Tetrazzini recipe looks like a perfect family meal. I am confused as to how many you think this will serve. How “thick” do you have the casserole in a pan. I think that would determine the cooking time. Like you mentioned I will serve a veggie, salad and bread so I think making one recipe should be enough. Thanks and Love this recipe. Hi Tiffany! If you don’t want to wait an hour after you return from your event to eat, I’d suggest cooking it before you leave and leaving in a warm oven while gone. If you do this, I’d cook it just until the edges start to turn golden but then stop~even in a warm oven it will continue to cook. Hope this helps! Let me hear how it turns out!!! Hi I want to prepare this before attending an event and come back about 3 hours to eat. What’s the best suggestion for cooking and reheating? Don’t want to wait an hour. 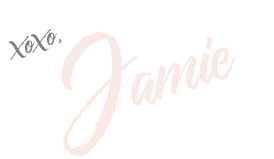 Hi Jamie, what size are your foil pans? Hi Jessica! Sorry to be just now replying (I hope you haven’t already had the party)! For 37 people, I would make 4 pans of this (double this recipe). Better safe than sorry, and this dish goes quickly. Folks devour it. Please let me know how it turns out!!! How many people does your Chicken Tetrazzini feed? I am interested in making it for a party. I see that it fills 2 lasagna pans or one very large casserole dish. Trying to decide whether to double the recipe to feed 37 people. Hi Cheryl! Thanks so much for your comment! I agree; sharp cheddar is non-negotiable:-) Blessings to you!!! I made this twice now. Didn’t change a thing on the recipe. Tastes great! Sharp cheddar cheese is a must. You may want to correct this statement! Hi Cathy! Even when I omit the mushrooms, I still add the EVOO and butter. It makes the soup taste more “homemade” like bechamel…..really adds flavor! This sounds delicious! We don’t care for mushrooms, so if I leave them out, should I add a small amount of EVOO and butter to the mixture? Hi Sandra! I think it would be fine to bake, freeze in individual portions, and then microwave. I would suggest thawing as much as possible before microwaving to ensure even heating. Let me know if this works; I’d love to hear! Do you think this would microwave well ? Would I bake before freezing if it were going to be microwaved out of freezer? My husband works out of town and only has a microwave to cook with. Hi Natasha! The soup cans are the standard Campbells soup can size~roughly 10 oz. You can use all chicken, all mushroom, or half of both. I use one can of each, but it is according to preference. YOU can’t go wrong~the end result is always yummy!!! Please let me know how you like it!!! Blessings to you! Hi Jeannie! I’ve never met anyone who didn’t like this:-) So glad your picky eaters enjoyed it! Blessings to you! I made this for a group of very picky eaters and it was a HUGE hit. Thanks for sharing! Hi Nancy, in my experience, each pan feeds 8-10. I always serve this with sides and bread, which makes a difference in how much folks eat of the tetrazzini. Let me know your experience, as I may need to adjust that number. Thanks!!! There is no way this recipe would serve 20 people. 1 box of spaghetti is 1lb and serves 8 2 oz portions.